There has been plenty of skirtspiration (yes, we just made that word up) going around these days. TV series like Suits, movies like The Proposal and celebrities like Kim Kardashian have made the skirt glamorous. Skirts can be a fun in-between to formal and casual attire. Good enough for office, but showing the just the right amount of leg! Now, who wouldn’t want that! Knowing how to complement your particular body type with a skirt can give the power you need to slay the day. 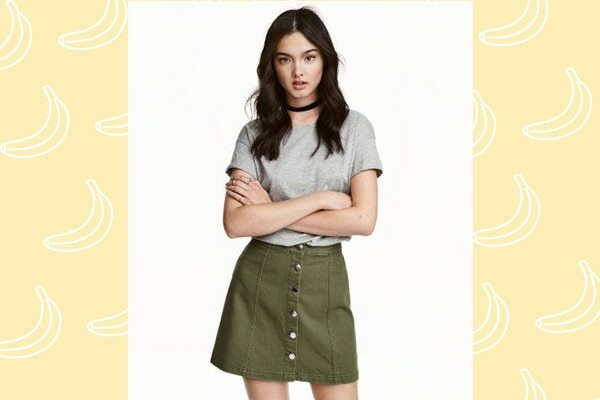 Fun and utterly feminine, we list some types of skirts that perfectly complement certain types of figures, so you know what to look for when you go shopping next! This body shape refers to when your hips, thighs and buttocks are the widest part of your body and your shoulders are narrow. Why: These skirts are fitted at the waist and accentuate the narrow area just above the hips and the little flare at the bottom nicely minimises the appearance of the width of your hips. It can be worn with heels or flats. This body shape refers to when you are wider at the shoulders and narrower towards your hips, with a little volume in the mid-section. Why: The high waist-band accentuates the narrowest part of your body while the flare of the skirt will nicely mask the mid-section. Pick a length that settles just above your knee, as this will draw attention to your legs. Tulip skirts also add shape to the lower half and balance out the shoulders. Opt for tops that show off your arms, like sleeveless and strapless ones and avoid closed and high neck-lines. This body type refers to when your shoulders, waist and hips are more or less the same width. What to go for: This is great figure to flaunt mini-skirts and figure-hugging silhouettes. Why: A body-fitted skirt will highlight your curves and show-off your legs. Wear a top that is no longer than your mid-section and avoid longer tops. You could also play with drop-waists, ruffles and tiered skirts. This body shape refers to a curvy body, with wider shoulders and hips with a well-defined, narrower hip. What to go for: Think Kim Kardashian and think pencil skirts. Why: A pencil skirt accentuates your waist and balances the shoulders and hips, while smoothing out the thighs. The look should be sleek and curvy. Wear this skirt with A-line tops or tops that define your waist. ARE YOU GUILTY OF MAKING THESE UNDERWEAR MISTAKES?